Just 20 minutes west of Denver at the edge of the Rocky Mountain foothills, Golden, Colorado is a modern-day gold rush town with something for everyone. The town was first settled in 1859 when Colorado was a US territory and served as the Territory Capitol until 1867 when the more developed city of Denver became the State Capitol (following Colorado statehood on August 1, 1876). Golden remained a small town through the mid-1900s until the growth boom after World War II. Today Golden’s population is around 18,000 people, but it still retains a small-town feel with a quaint downtown area, winding bike trails, parks, a wide variety of outdoor adventures, and ample opportunity to slow down and take in a quiet evening. Golden is set geographically apart from the Denver area by North and South Table Mountains—two mesas capped by ancient basaltic lava flows—on the east side. Clear Creek, sparkling with mountain snow run-off, bisects the town from west to east making for a leisurely creek-side stroll along the adjacent walking paths and parks. 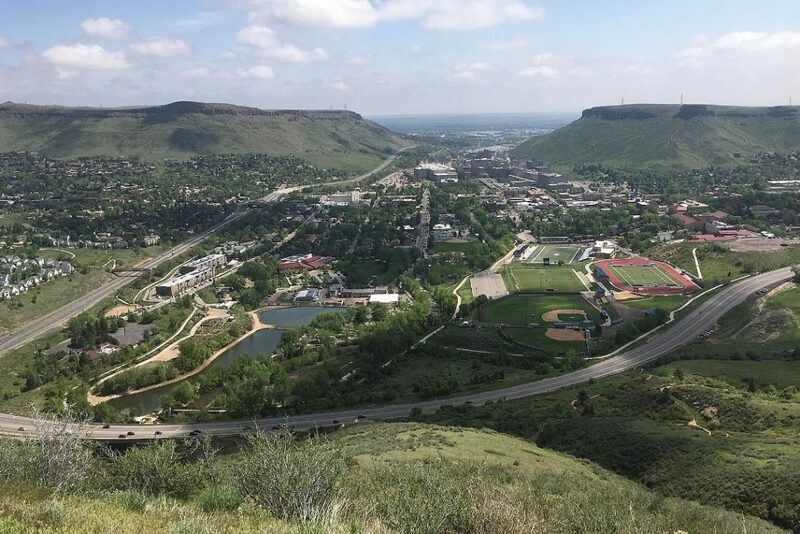 Lookout Mountain—where the grave of “Buffalo Bill” Cody sits—shelters the town from the west and offers impressive views for those willing to drive, bike, or run up the steep grade to the top. The Clear Creek History Park is a 3-acre outdoor walking tour area on the south side of Clear Creek just a block from downtown Golden that transports you back to the 1800s frontier days of Golden. Clear Creek White Water Park is a nationally renowned kayak watercourse located along Clear Creek through the center of town. Even if you aren’t a white-water expert, watching others navigate the course while you cool your toes along the shore is entertaining enough. On Saturday mornings from June until early October, an impressive Farmer’s Market is held on the north side of Clear Creek near the History Museum and White Water Park. The outdoor market features local vendors selling produce, food, beverages, and other goodies. 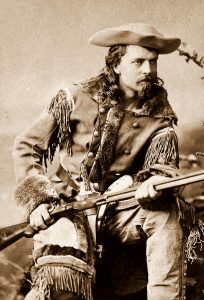 Buffalo Bill Cody circa 1880. Buffalo Bill is buried on top of Lookout Mountain in Golden, CO. Celebrate Golden’s annual Buffalo Bill Days that includes a parade, live music, classic car show, events, golf tournaments, Cody’s Wild West Show, and more! Events start the last Thursday in July. Mid-August brings the Golden Fine Arts Festival that always draws a crowd. This nationally renowned 3-day festival features a prominent art show with media including jewelry, painting, sculpture, and photography. There is also music, local food and beer, and free art activities for children. Big Ring Cycles hosts weekly road rides on Thursdays at 6 pm through the summer season. You can join in on a recreational cruise for all abilities, or a heart-pumping training ride for the fitness riders. Rock climbing, hiking, golfing, hang gliding, mountain biking, and running trails are all easily accessed from downtown Golden. 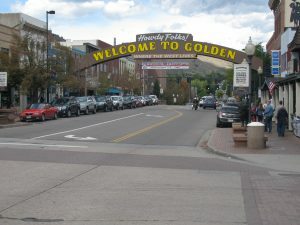 In addition, Golden is home to the Colorado School of Mines campus (founded 1874), the Colorado Geological Survey (founded 1907), the American Mountaineering Center and Colorado Mountain Club (founded 1912), the Golden History Museum and Park, the Foothills Art Center, Fossil Trace Golf Club, Splash Water Park, and the Mother Cabrini Shrine. A thriving beer industry includes Coors Brewery, Golden City Brewery, Cannonball Creek Brewery, Barrels & Bottles Brewery, and Mountain Toad Brewery. There is even the Golden Moon Speakeasy distillery. Food choices ranging from laid-back pizza and burgers to Thai, Nepalese, and Continental elegance can be found along the historic downtown area. 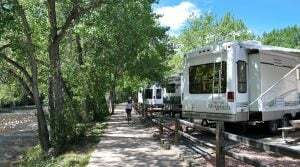 The City of Golden owns and operates Clear Creek RV Park, located on the west side of the town on the banks of Clear Creek within walking distance to downtown Golden. The quiet, treed park has 22 full-hookup sites and 11 50-amp electric only sites. There are also on-site restrooms, showers, and laundry facilities, as well as a dump station.